The familiar stories include the abused woman whose partner has mysteriously disappeared; the bad seed; the tortured blind man; the person flung out of time; and even a sorority seance. These are all Richard Matheson/Val Lewton-style creeping terrors, and to their credit there are few cheap “jumping out of the closet” scares. Four of the plays are solidly in Night Gallery territory, with the fifth (which I found to be the most satisfying, despite its short runtime) more Twilight Zone fare. All of the short plays rely on elements of dread and surprise at their twists, so there’ll be no further summaries here. However, several spoiler-free aspects are worth calling out. First, Madison Stoner’s evil foster child in Rip’s New Girl is as creepy as all get-out, and kudos to director Emma Wise (and/or perhaps producer Rip) for setting the piece in the claustrophobic basement. Stefannie Flannigan and Demis Odanga, in Adam Corrigan Holowitz’s Wings , deal well with the difficult task of emoting with their faces and eyes, respectively, invisible to the audience. And Lisa DesGroseilliers’ audio tracks, despite being broadcast from a different room, are just the right touch to make Alexandra Grant and Charlene McNabb’s performances in Jen Frankel and Jennifer Venner’s Kiss Love Sky all the more believable. 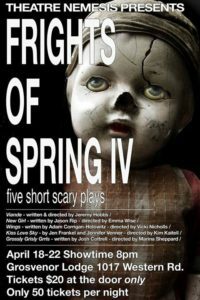 Frights of Spring is a unique experience in London, giving a group of selected playwrights the opportunity to create an evening of themed performances. While the plays and performances aren’t all of equal calibre, they’re all entertaining, and worth a night out. A final aside: as a building, Grosvenor Lodge is a great place to hold this event. However, as a performance space, the signs of its day-to-day use as an office for heritage groups and wedding venue make suspension of disbelief difficult. With the dearth of available sites in London, though, one has to do with what one’s given.